Devi Mandir. Books with Sanskrit, English transliteration and meaning; some with corresponding tapes with learning aids. Shri Veda Bharathi: Hyderabad. Offer audio cds, multimedia cds and books on Veda. Talking Books by AGII. Several books on audio and video. The Hare Krishna Catalog. Books, tapes, CDs, videos, and other devotional paraphernalia. The Sacred Sounds of Mother's Ancient Harmonic Arts. 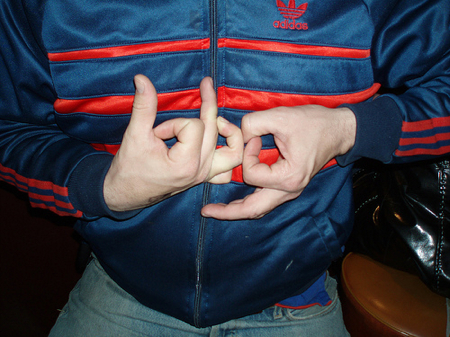 [Image above from http://www.dailynugget.com/2006/03/blog_gang_sign.php (Blog Gang Sign, Represent - The Daily Nugget - A San Francisco Blog), which is no longer extant. UniYatra Blog. Ameeta and Craig, along with the UniYatra Group, create and provide educational, cross-cultural, and technical products and services. We use this blog to share our ideas, experiences, questions, and discussion about everything from travel, culture, society, and learning. Aurobindobooks.com by Lotus Press. US publisher of books by and about Sri Aurobindo, Integral Yoga, Vedic Astrology, and other religious scriptures. Bhaktivedanta Library Services European distributors of Srila Prabhupada's books. Desh-Videsh Books. Source for books on Indian culture and the Hindu religion. Desi Kids. Offer religious and mythological books, CDs, and DVDs for Indian children. Giri books. Webmaster: These are in English, but there are others available in Hindi, Kannada, Malayalam, Sanskrit, Tamil, and Telugu. See Books [in many languages]. Hare Krishna Store. Offer books of A.C. Bhaktivedanta Swami Prabhupada, CDs, DVDs, MP3s and VCDs. Himalayan Academy Books. Books on Hinduism by Satguru Sivaya Subramuniyaswami. Hinduism: Wisdom and Way and Other Hinduism Resources. Khemraj Shrikrishnadass. Publisher of religious books in Mumbai, India. Krishna culture. Books by author. Maharishi's Programmes in India. Books and tapes about Transcendental Meditation and Maharishi's philosophy. Matchless-gifts.com: Religious Gift Items from India - Religious books. Nityananda Institute's Rudra Press. Books of the teachings of Swami Chetanananda, Swami. Sai Towers. Books, photographs, calendars, and music about Baba. Information on accommodation nearby Ashrams in Puttaparthi and Whitefield. Sanatan Society - Hinduism books. South Asia Books. Sells books from Motilal Publishers on Hinduism and other subjects. Sri Sathya Sai Baba Book and Information Centre. The Official Bookcentre of the Sai Organization in Canada. Sri Sathya Sai Books and Publications Trust. Online bookstore run by the trust. Srinivasa Gita Satsangh Trust. A charitable organisation publishing and selling books relating to Hinduism and Bhagavad Gita. Stephen Knapp And His Books on Spirituality and Vedic Culture. Books and articles on Eastern philosophy. Swami Krishnananda Books. Online books on yoga and meditation, philosophy, metaphysics, mysticism, Hindu scriptural texts such as the Bhagavad Gita, Upanishads and Vedanta. Vedanta Cultural Foundation. Offer publications on Vedanta and Baghavad Gita. Vedanta Press titles. Books on some of the major philosophies and personalities of Hinduism, including Ramakrishna, Swami Vivekananda, Ramana Maharshi, and Nisargadatta. Voice of India Publications. Offers books on Hinduism. Includes a few books on line. Wisdom. Catalog of select publications regarding Hinduism and Indian cultural issues. Yoga Vidya. Publisher of books about Yoga. Hare Krishna Store. Offer books of A.C. Bhaktivedanta Swami Prabhupada, CDs, DVDs, MP3s and VCDs. P> KrishnaCulture: VIDEOS, DVD's. Krishna Software Inc.-- Spiritual Multimedia CDROMs. Archives of the Bhakti mailing list. about.com - Hinduism - Organisations. Google Directory - Society > Religion and Spirituality > Hinduism > Organizations. List of Hindu organisations - Wikipedia, the free encyclopedia. Open Directory - Society: Religion and Spirituality: Hinduism: Organizations. Organizations < Hindu in the Yahoo! Directory. SPLENDOUR - a monthly spiritual magazine from YMA Publications. Angika Abhinaya, Asamyukta. Pictures of Indian gestural dance mudras. Dhyansanjivani spiritusl... all kind of spiritual info and spiritual shop. Webmaster: A huge resource on specific topics. Encarta. Hinduism. An excellent introduction touching on all of the basics. Hinduism - Ontario Consultants on religious tolerance. The Hindu universe: The Hindu Resource Center. Bar-Tzur, D. Deaf cultures: India. stacygm. Deaf Vlog: Part 1-Studying Hinduism. Just introducing how I started studying Hinduism. Hey I need to know the sign for "hinduism" and "hindu". If you know it, pls send me a video reply. Thanks! Deaf Vlog: Part 2-My Guru. The meaning of the word "guru." Westerwoudt, M. (1990, June). Dutch Teacher Brings Yoga to Holland's Hearing Impaired. Inez Damen, a professional yoga teacher in the Netherlands for 10 years, is developing a system to teach yoga to deaf and hard of hearing students. Inspired to spread the world's oldest science to any eager student, Inez began training at the Foundation for the Hearing Impaired in Amsterdam with the goal of developing a yoga course using alternative methods of communication such as sign language and mime to meet the unique needs of an often over-looked minority. Hare Krishna: Ontario Consultants on religious tolerance. The Hare Krishna home page. Hare Krishna welfare for the Deaf. ISKCON UK and Ireland home. Charity a daily occurrence at Om Sakthi Narayani Siddar Peedam. A downloadable .pdf file. Shiva Shakti Mandalam: Tantrik home page. Dehee Bharatanatyam - Araiyar sevai. Dehee Performing Arts and Education Center. Gaudiya Vaishnavism - Wikipedia, the free encyclopedia.